This $2.00 coin has so much wrong with it! There is a die crack in the "N" of Canada on the reverse. The centre section is offset towards the 7 O'Clock direction. 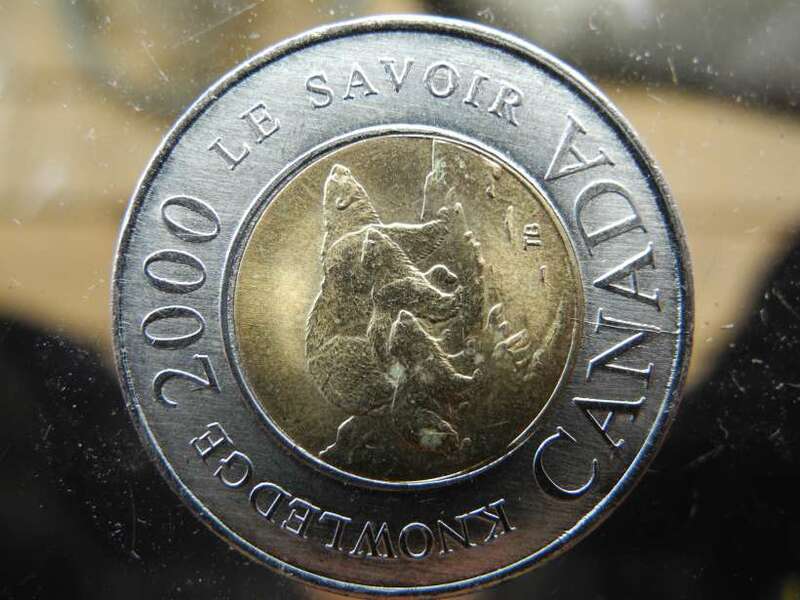 There is an extra 'blob' located under the leading bear's paw and there may be a crack in the "2" of 2000. I'm fairly new to this forum, so, is this normal for the 2000 Knowledge twoonie? I know next to nothing about toonies, but the D/C at the "N" that actually travels up into the middle planchet section is something that I've never seen. Those are 2 separate pieces of metal and, mechanically speaking, would seem to be impossible to make the crack continuous. Thanks for your input on this coin. I figured if it was a 'crack' as in, when the centre was attached, it would show on both sides, but the head of the coin is very clean and no marks. The obverse is full of errors, at least 4 that I can see. No, the "crack" would be in the working die and there is a separate die for each of the Obverse and Reverse sides. A die crack shows as "raised" on the coin. Any thoughts on the extra 'lump' under the biggest bear's paw? It isn't a uniform size, i.e., not round but a 'glob'. And of course the uncentred centre.